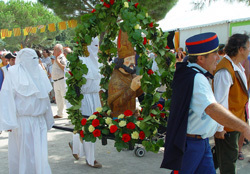 Romerage procession is the opportunity to bring an ancient local tradition to life again, already a living tradition when Le Lavandou was Saint-Clair Chapel. Le Lavandou still only a little fishermen's hamlet linked to Bormes. Once a year, the villagers celebrated the religious festival of their patron Saint-Clair, by organising a long solemn procession through the narrow streets. 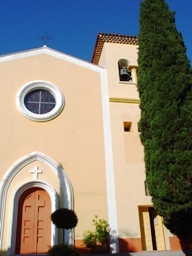 Since 1996, Saint-Clair quarter on the east of Le Lavandou, welcomes the bust of the Saint, who is also the patron saint of the seamstresses, and whom legend tells that he has the power to cure blindness. Punctuated by fanfares, pauses on the beach, songs and dances, the processionleadsthe square of the chapel of Saint Clair (2 kilometres). Three littleplays, acted out in the Square of the Romérage, follow this procession before giving way to folk dancing : The dubbing of the prior, representing civil authority at the place of worship, the presentation of offerings to the poor hermit, and the revelation of the white penitents. 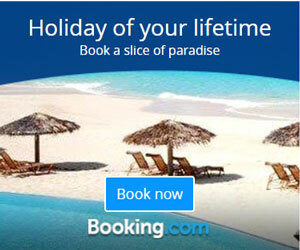 French Romerage is a Provencal word from Roumo viaggi ie the journey - or pilgrimage -to Rome. Called roumiou Saint-Clair du Lavandou.France pilgrims going to Rome. By extension, roumavage meant "pilgrimage" in the broadest sense, and now applies to processions Festivities votive or a parish. Lou Roumavage Santo Vitori, for example, is a small local pilgrimage since Pertuis to the mountain of Sainte-Victoire where there is a stele on which are engraved texts in Latin 4 to Rome (East), in Greek to the South, in French to the North, and finally the fourth in Provence to the West, which is due to Frederic Mistral. In French, roumavage became, by phonetic alteration romeirage then finally Romerage. However, many participants ignore the profound significance of the ritual, merely a happy tourist spectacle devoid of spiritual meaning.